Change the way you think about cooking pasta! Barilla® Pronto®, the easy-to-prepare pasta that is ready in minutes. Barilla® Pronto® is prepared in one pan – no need to wait for water to boil, and no draining required! Available in five delicious shapes (Half-Cut Spaghetti, Penne, Elbows, Half-Cut Linguine and Rotini), Barilla® Pronto® will help make your pasta mealtime prep faster and easier – all in one pan! 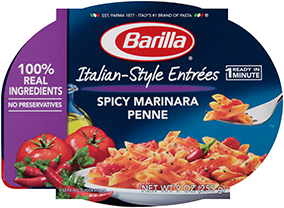 Barilla Pronto® pasta is made with non-GMO ingredients. For more information, please read our position. Pronto® not only saves time, but also 60% less energy and less water!